What is an Officer of The Salvation Army? Grounded in Faith. Open to All. The Salvation Army serves without discrimination. Together we are doing the most good and making a difference in Central Ohio. Help us in our quest to meet basic needs without discrimination. Welcome to The Salvation Army in Central Ohio, whose history dates back to 1865 when a radical Methodist minister took to London's slums to champion the poor and neglected. The organization's founder, William Booth, began a movement that outlasted his lifetime and changed the face of philanthropy. 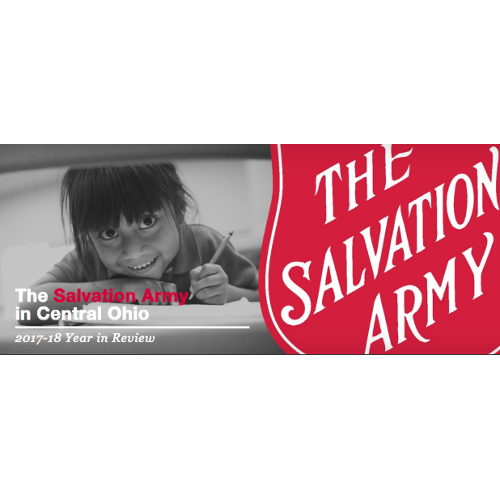 Since 1885, The Salvation Army of Central Ohio has been providing clothing, furniture, food, utility bill assistance, job training, after school tutoring, warm winter coats, youth summer camp, Christmas assistance, meals and many other services to Franklin and Delaware County families and people throughout our Central Ohio communities. Anyone who walks through our doors is served and received with open arms. Call us today at 614-221-6561. The Salvation Army in Central Ohio: 966 East Main Street, Columbus, Ohio 43205. 614-221-6561.